This was not an easy process. The goal here illustrates the fact that free agency classes can be fickle, to say the least. Which NHL free agents will provide the biggest point per dollar return? Better yet, which ones will not end up in the buyer’s remorse category? Those were two major factors to consider. Age is another big aspect as far as pre-prime, prime, near past prime, and past prime. Now, the scene shifts to the first timers, who are most likely to get paid. Apparently, more free agents are near, at, or over this number than expected. Expect the unexpected here as far as dollar amounts, and more. Here are three of the most sought-after NHL free agents from the first timer centers category. Nelson’s October start has fueled speculation as to where he might wind up. His price tag will be moderate more than likely. His metrics appear all over the place and in a mostly bad light. For example, Nelson carries -4% on average relative to possession. However, the PDO at even strength remains over 110!. That is ludicrous. The good thing is Nelson is lighting the lamp on reasonable shot volume. With a seven-goal start, the center could easily top 20-25 goals. Consider the forward is seeing upwards of 19-20 minutes a night. That sheer amount of ice time lends itself to opportunities. He’ll earn $4.25 million for the 2018-19 campaign. What could he make for 2019-20? The projected cap next season allows New York or any other team to go for a modest increase perhaps. Nelson starting out hot is nothing new. How he finishes will ultimately set his future worth. Dzingel presents a weird case in the sense that he has not been building up to a breakout. The forward scored his seventh goal of the year on Thursday night against Vegas. Though the Senators have been awful defensively, Dzingel’s on-ice shooting percentage is above 12%. Unfortunately, questions always arise when starts like this occur. Ottawa has been a fun team when it comes to overall scoring — both for an against. Zone deployment remained mostly the same from the 2017-18 campaign. Most forget Dzingel scored 23 goals. He has a chance at perhaps 25-30+ goals which could mean a significant raise come next season. Dzingel earns $1.8 million for the 2018-19 season. What may he get paid for 2019-20? Would Ottawa consider locking him up much sooner? That’s a great question. A trade possibility looms slightly but does not appear likely at this time. Again, how Dzingel produces the rest of the season will impact his next deal. Potential exists for a doubling or more of his salary. Likely, Duchene’s next deal will come under some scrutiny. Duchene’s last contract bought up some unrestricted free agency time. He wound up in Ottawa via trade while the Colorado Avalanche began their rise to a playoff berth last year. Duchene still tallied 59 points in 82 games despite some noteworthy point droughts. 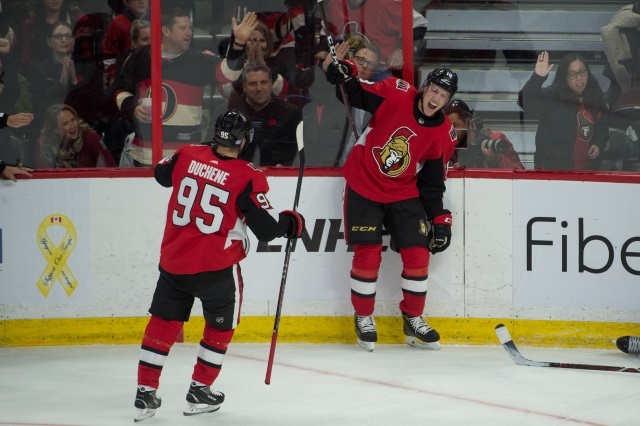 The good thing is Ottawa believes they can retain Duchene’s services. There have allegedly been some substantive talks as well. Currently, the center is averaging a point a game on the campaign. He’ll earn $6 million for the 2018-19 campaign. What could he make for 2019-20, if he chooses to return? Ottawa could package a deal that is about the same or slightly higher than what he currently makes. Remember, Mark Stone is also on the horizon to sign and Stone should command more dollars.